Record-breaking boat Virgin Atlantic Challenger II is back in British waters for the first time in 16 years after arriving in Plymouth yesterday after a journey from Mallorca. She was brought here by new owner and local businessman Dan Stevens, who found the boat rotting in a Palma boatyard and set about restoring her. 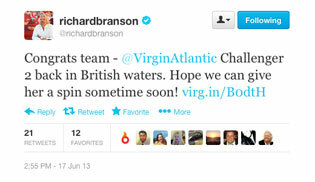 Virgin Atlantic Challenger II, carrying Richard Branson, crossed the Atlantic in three days, eight hours and 31 minutes in 1986, breaking the previous record by just two hours. Stevens says he will now continue his restoration of the 72ft boat, which he intends to race in the Cowes-Torquay-Cowes and take around Britain. Stevens told the Plymouth Herald: “It’s only done 800 hours on the clock; a lot of that was done up until 1996. It’s only done 70 since then.